Speed in the weight room = Speed on the field. 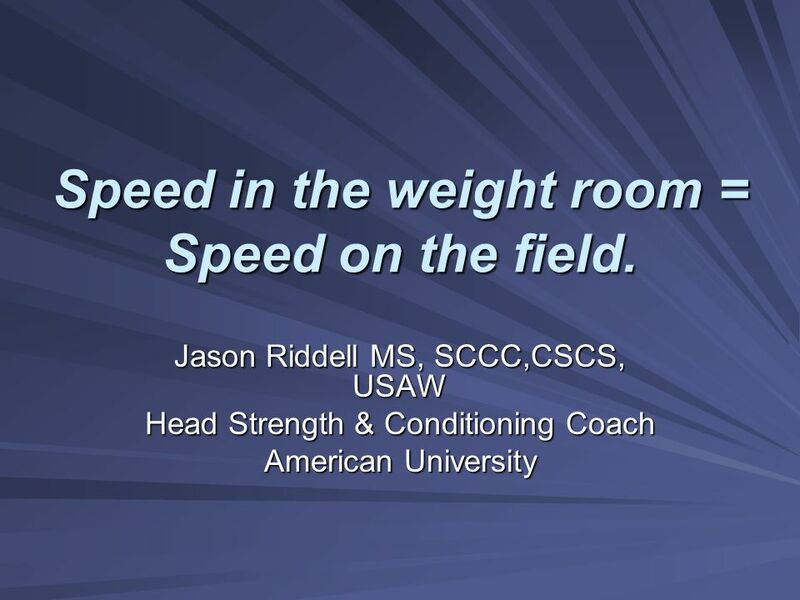 1 Speed in the weight room = Speed on the field. 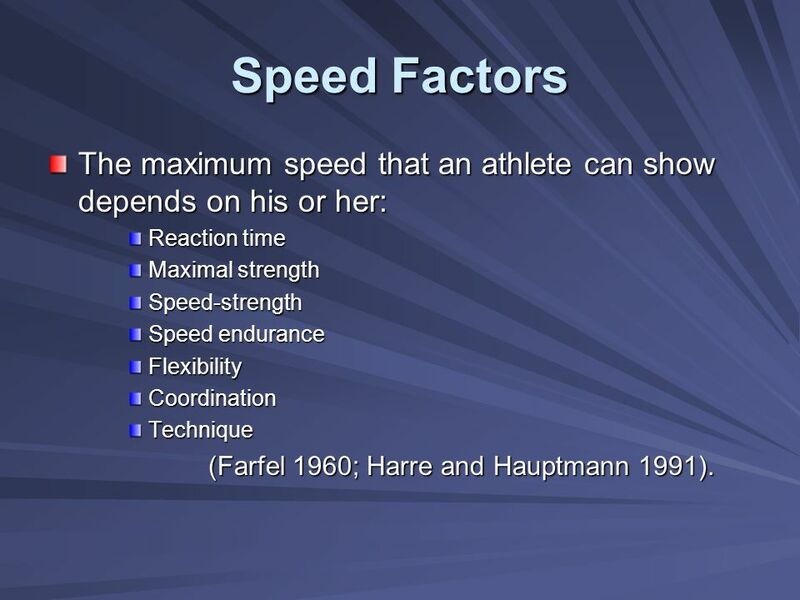 3 Speed Factors The maximum speed that an athlete can show depends on his or her: Reaction time Maximal strength Speed-strength Speed endurance Flexibility Coordination Technique (Farfel 1960; Harre and Hauptmann 1991). 4 What Speed is not! 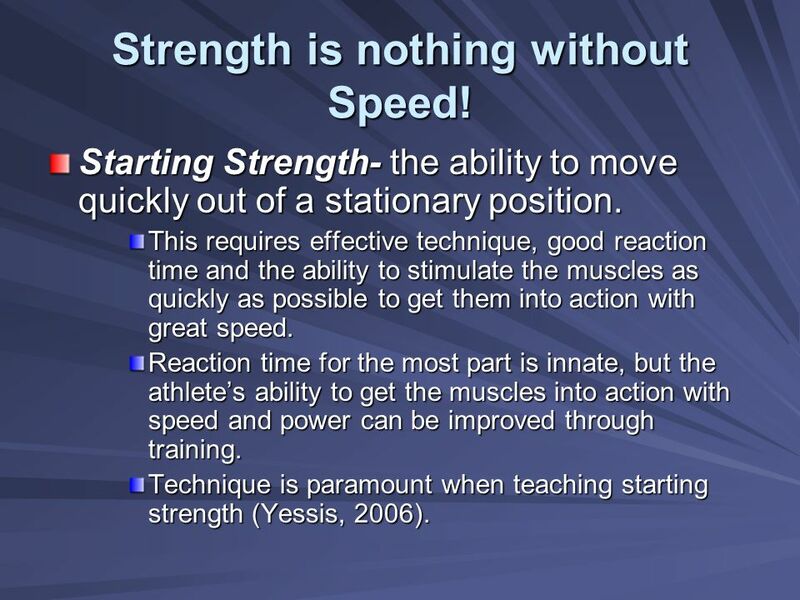 5 Strength is nothing without Speed! 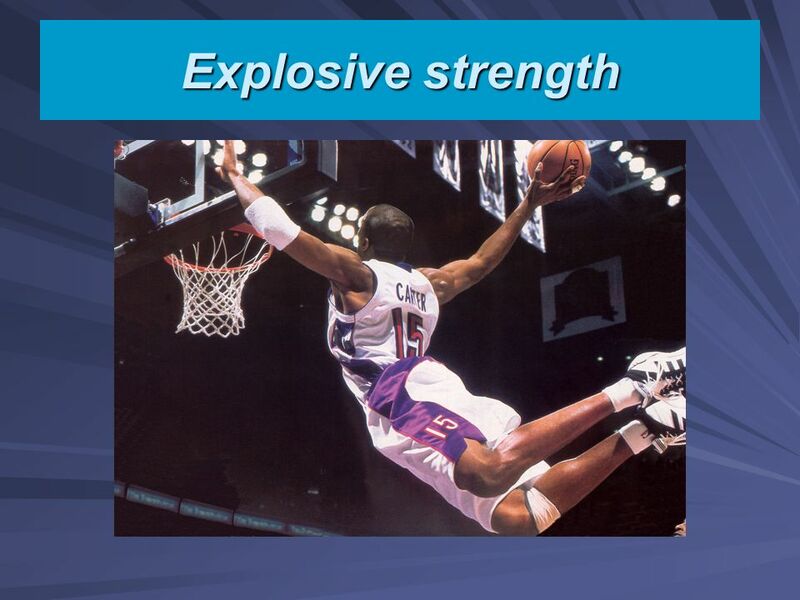 Explosive strength- relates to how quickly and forcefully the muscles contract, the key to all quick movements. 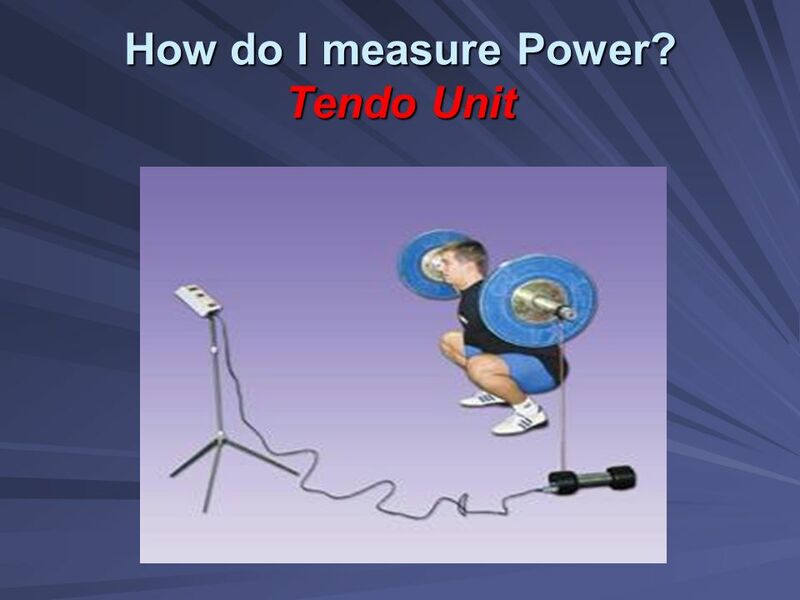 To elicit explosive strength, the muscles and tendons must be pre-tensed eccentrically before contracting. When the tension is sufficiently great, the muscular contraction switches to concentric – the muscle and tendon shorten very quickly to start the movement and explosive strength is then displayed (Yessis, 2006). 7 Strength is nothing without Speed! 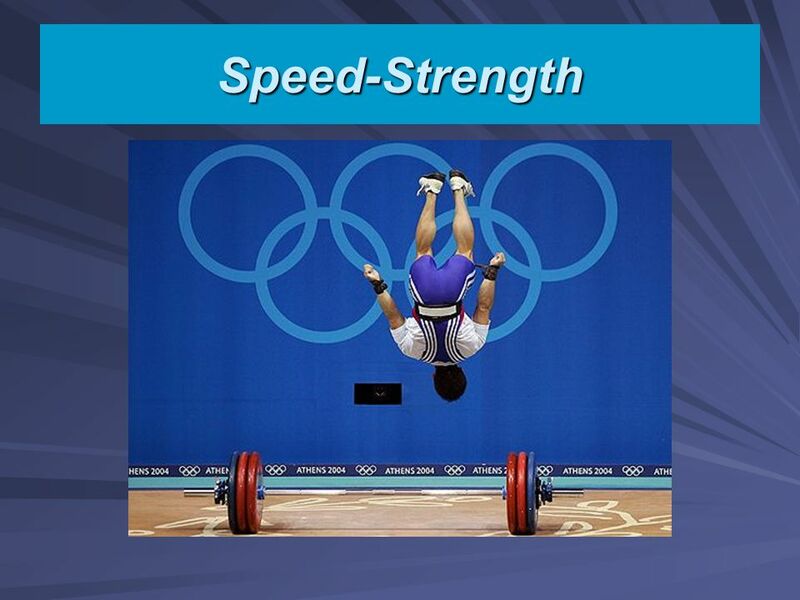 Speed-Strength- is synonymous with explosiveness or explosive power and is exhibited in movements that require speed coupled with strength. 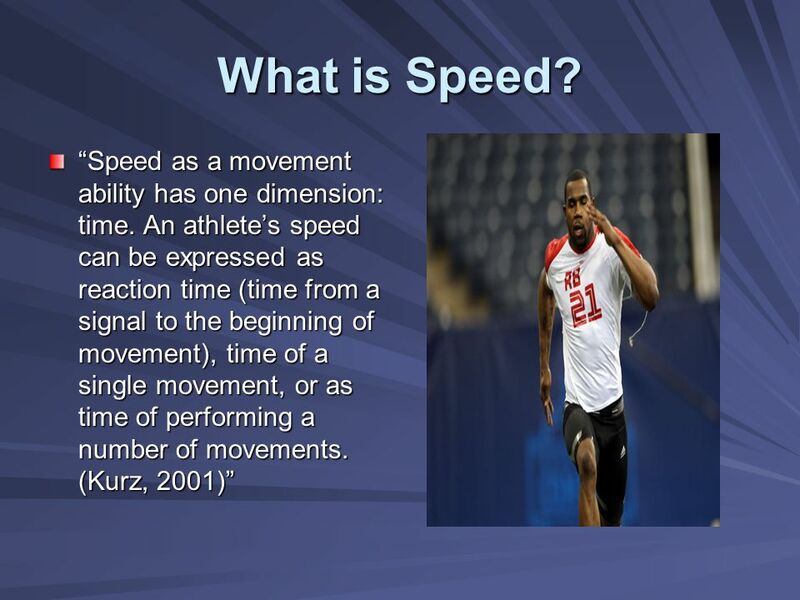 Speed of movement is the key component for success in sports that require quick execution of skills. 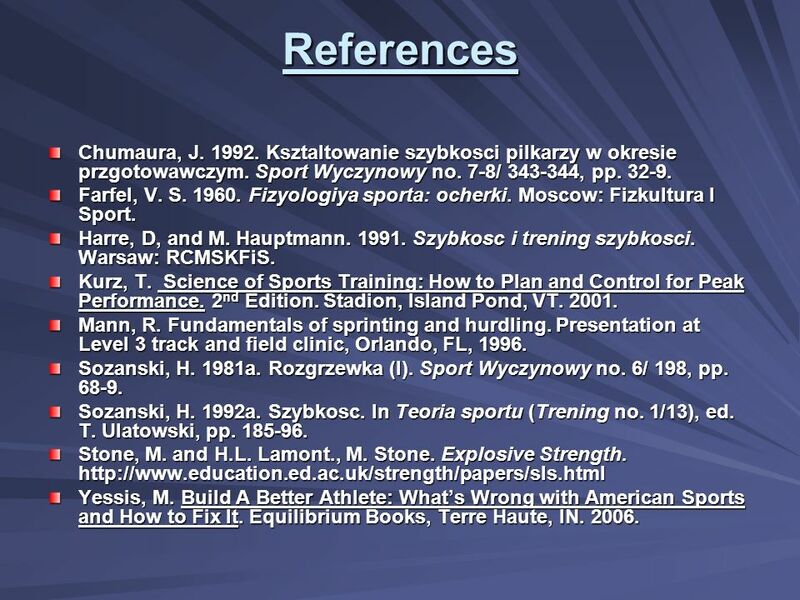 The faster and more forcefully the skills are executed, the more successful the athlete usually is (Yessis, 2006). 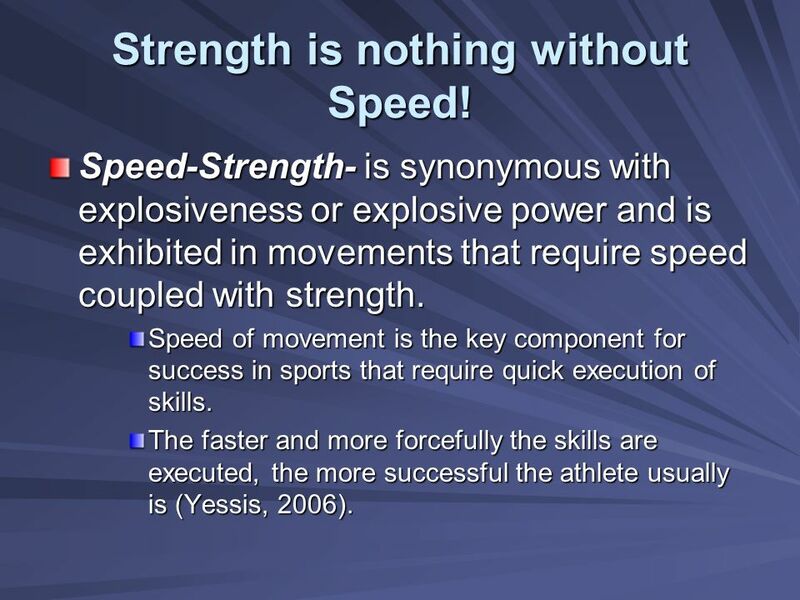 9 Strength is nothing without Speed! 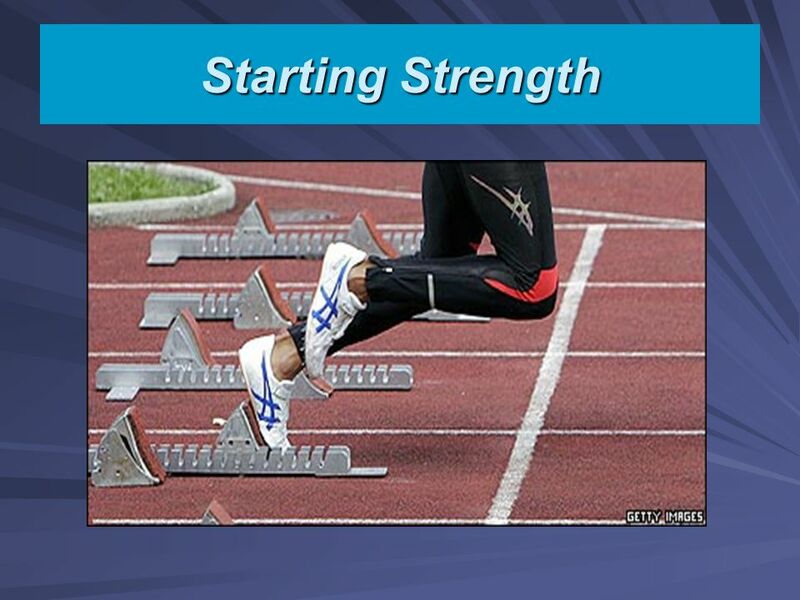 Starting Strength- the ability to move quickly out of a stationary position. This requires effective technique, good reaction time and the ability to stimulate the muscles as quickly as possible to get them into action with great speed. Reaction time for the most part is innate, but the athlete’s ability to get the muscles into action with speed and power can be improved through training. Technique is paramount when teaching starting strength (Yessis, 2006). 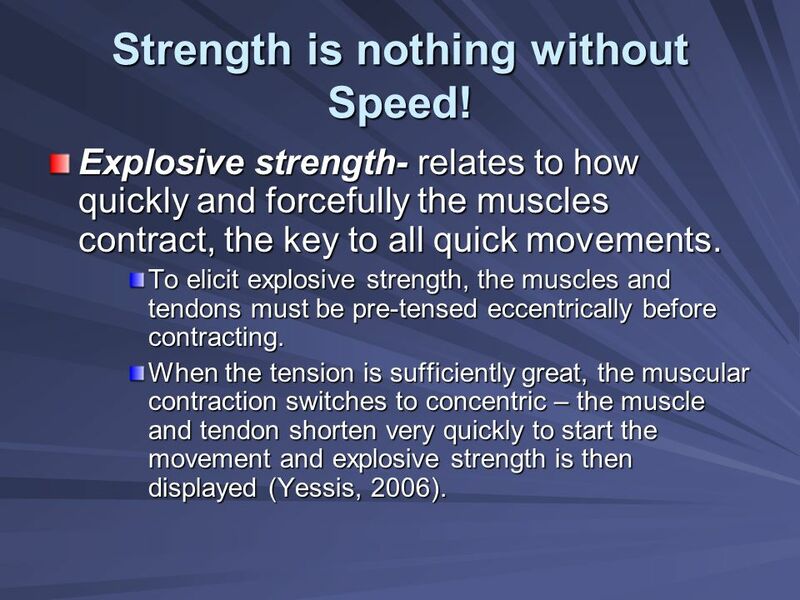 11 Strength is crucial but Speed rules! During sprinting elite male sprinters use an alternating pattern of vertical ground reaction forces and the center of mass moves upward at a velocity of 0.49m/s and downward at 0.49m/s. Their average foot contact time is 0.087s and the average body mass is approximately 79.5kg (Mann, 1995). 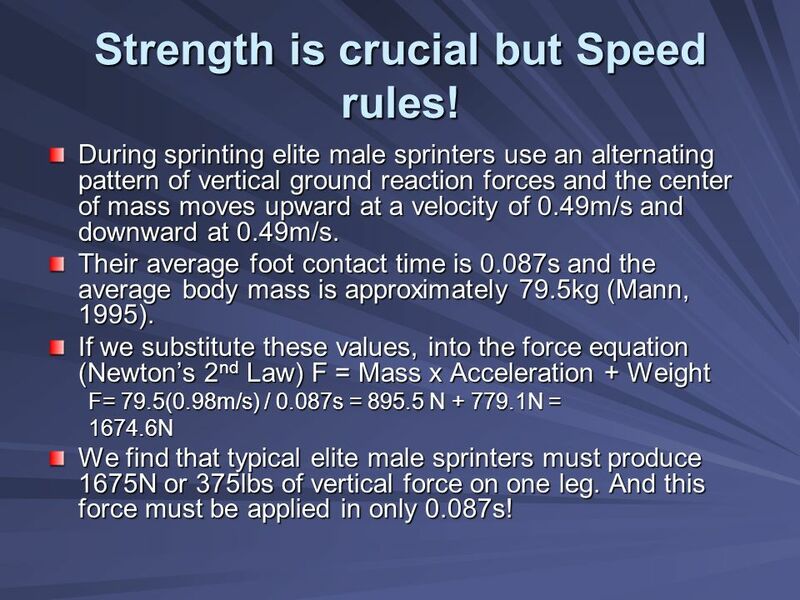 If we substitute these values, into the force equation (Newton’s 2nd Law) F = Mass x Acceleration + Weight F= 79.5(0.98m/s) / 0.087s = N N = 1674.6N We find that typical elite male sprinters must produce 1675N or 375lbs of vertical force on one leg. 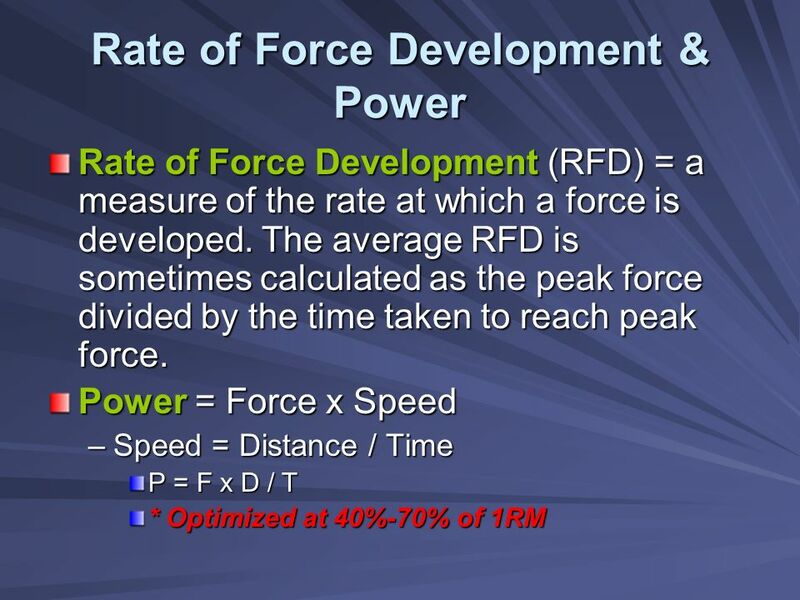 And this force must be applied in only 0.087s! 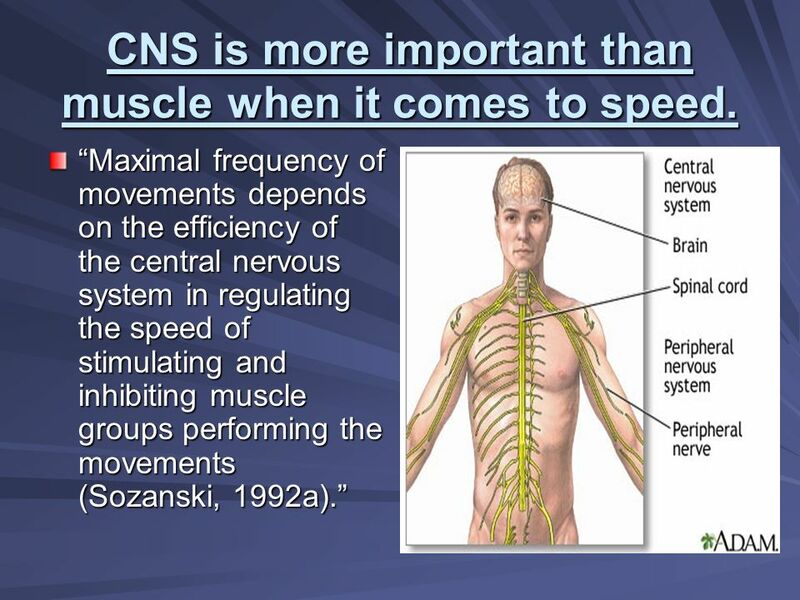 12 CNS is more important than muscle when it comes to speed. 14 Is an athlete ready for explosive exercises? Is the height of their vertical jump significantly less than that of other athletes in their sport that jump well? Is the athlete’s maximal strength much lower than that of leading athletes in their sport who display adequate explosive strength? 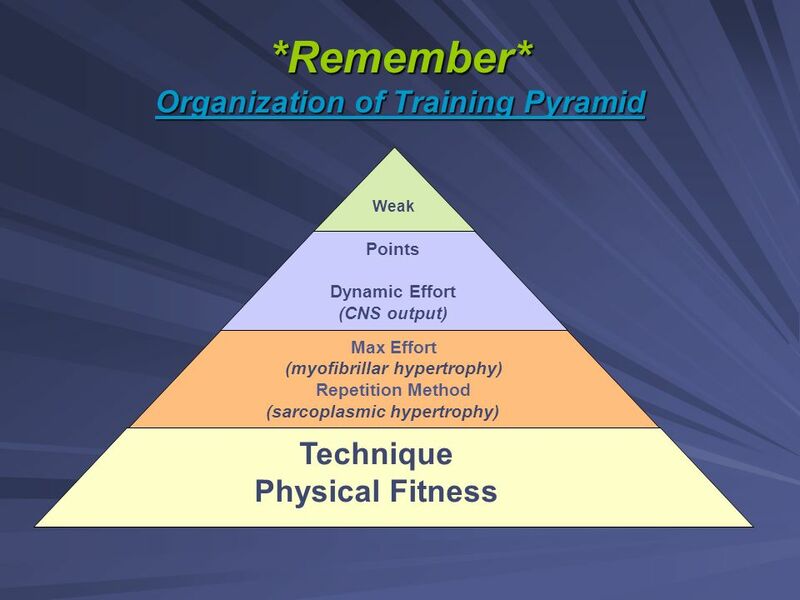 If yes then the athlete may have to first work on increasing their maximal strength or another aspect lower on the pyramid. 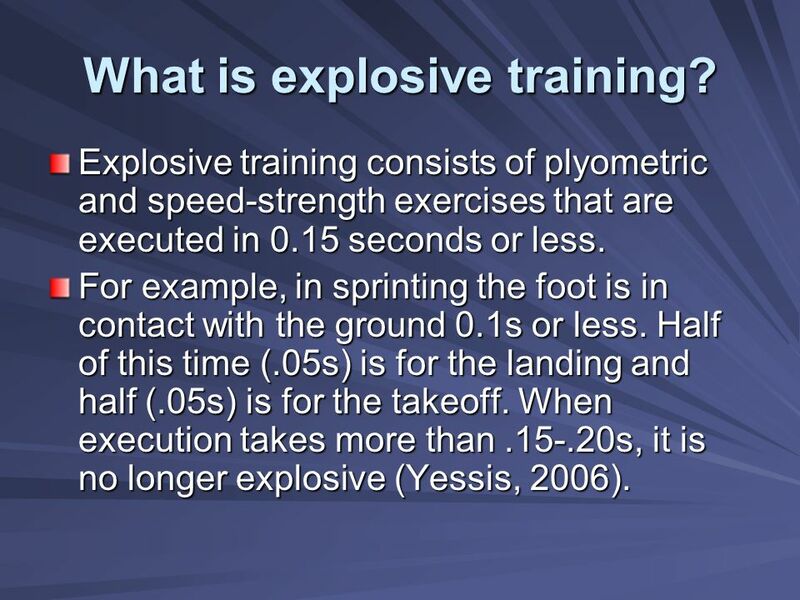 15 What is explosive training? 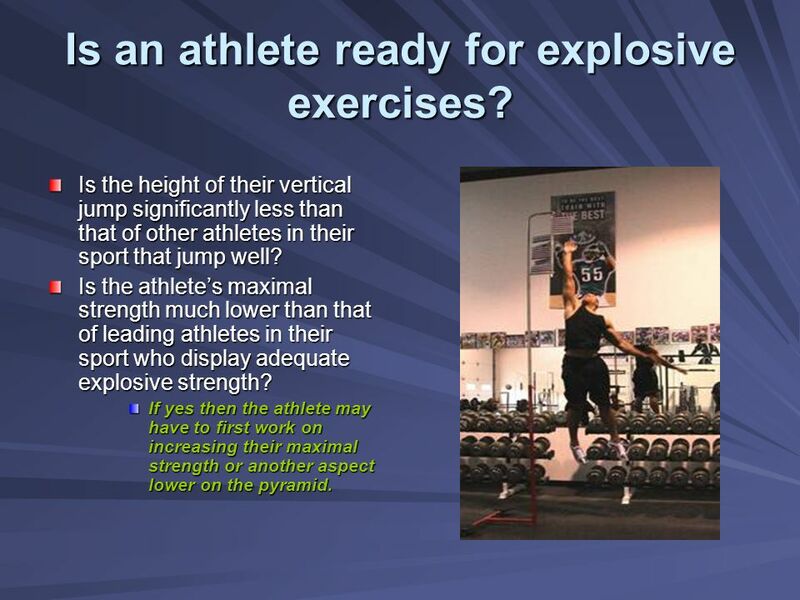 Explosive training consists of plyometric and speed-strength exercises that are executed in 0.15 seconds or less. For example, in sprinting the foot is in contact with the ground 0.1s or less. Half of this time (.05s) is for the landing and half (.05s) is for the takeoff. When execution takes more than s, it is no longer explosive (Yessis, 2006). 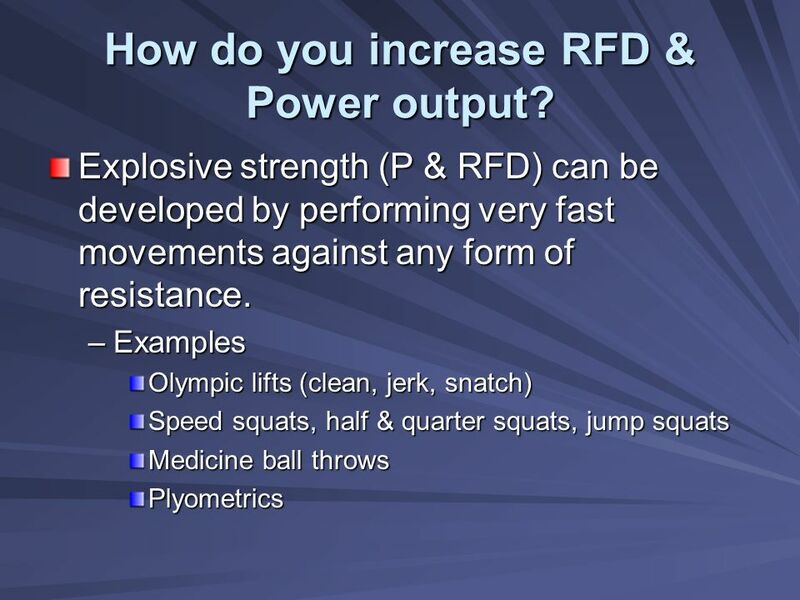 17 How do you increase RFD & Power output? 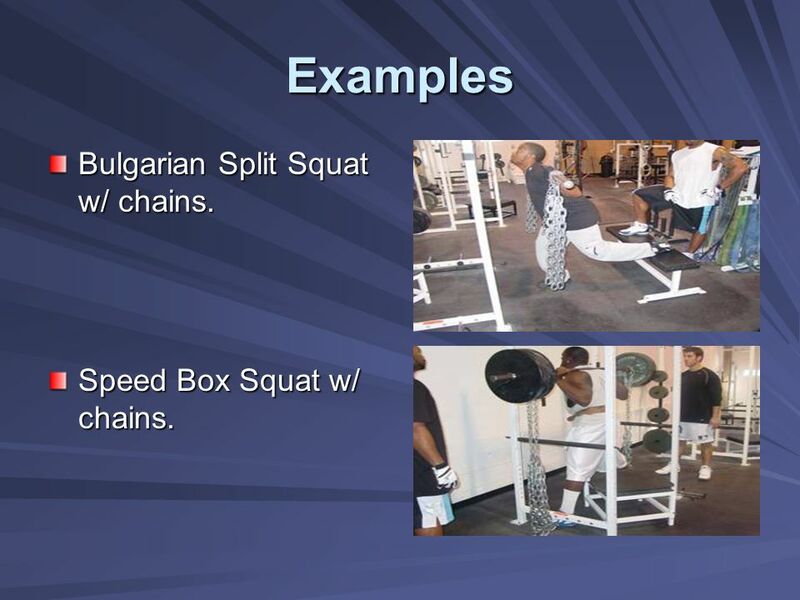 18 Examples Bulgarian Split Squat w/ chains. Speed Box Squat w/ chains. 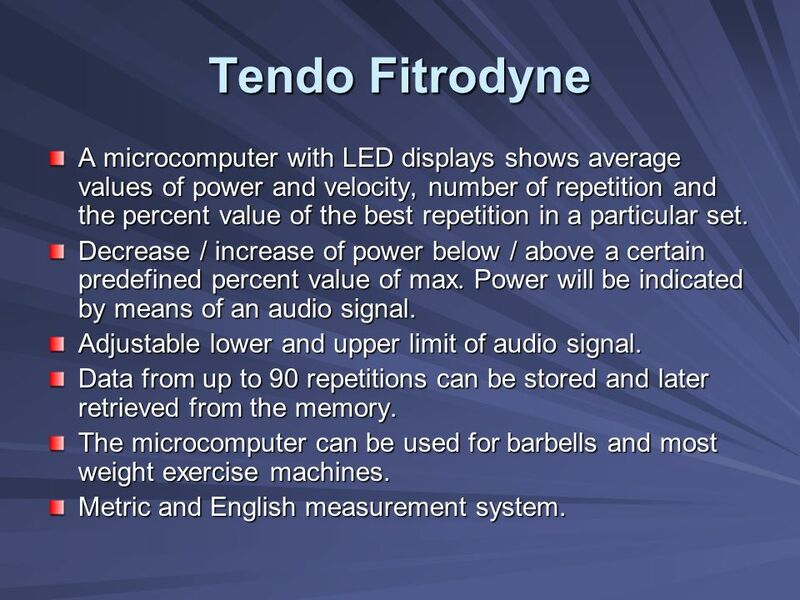 21 Tendo Fitrodyne A microcomputer with LED displays shows average values of power and velocity, number of repetition and the percent value of the best repetition in a particular set. Decrease / increase of power below / above a certain predefined percent value of max. Power will be indicated by means of an audio signal. Adjustable lower and upper limit of audio signal. Data from up to 90 repetitions can be stored and later retrieved from the memory. The microcomputer can be used for barbells and most weight exercise machines. Metric and English measurement system. Test- Max back squat with a pause on the pins at parallel. 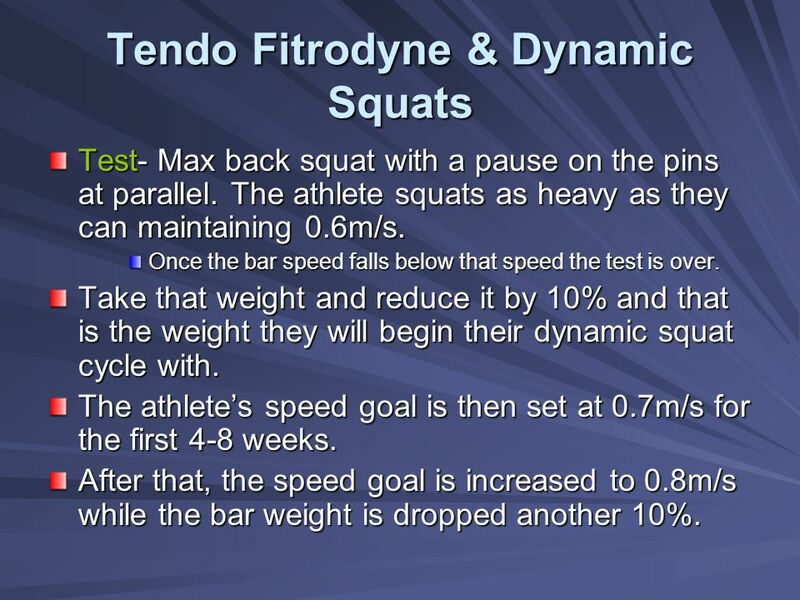 The athlete squats as heavy as they can maintaining 0.6m/s. Once the bar speed falls below that speed the test is over. 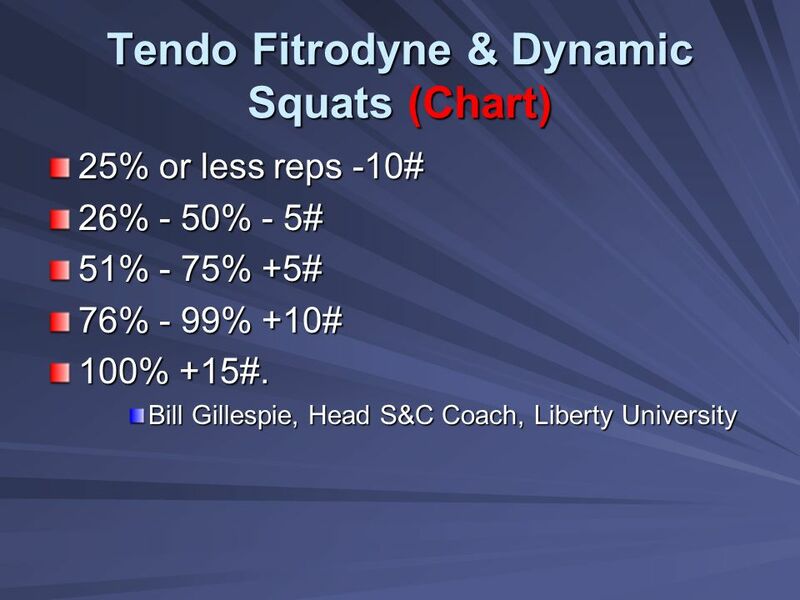 Take that weight and reduce it by 10% and that is the weight they will begin their dynamic squat cycle with. The athlete’s speed goal is then set at 0.7m/s for the first 4-8 weeks. After that, the speed goal is increased to 0.8m/s while the bar weight is dropped another 10%. 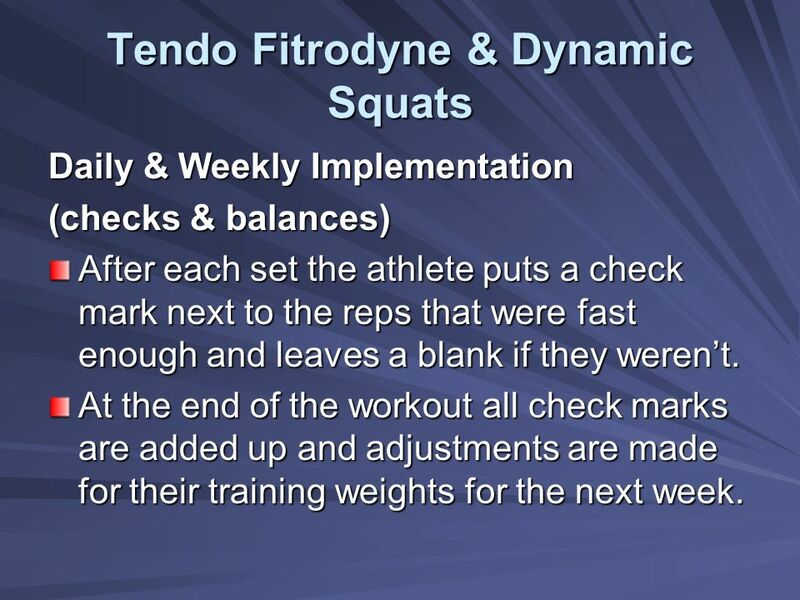 Daily & Weekly Implementation (checks & balances) After each set the athlete puts a check mark next to the reps that were fast enough and leaves a blank if they weren’t. At the end of the workout all check marks are added up and adjustments are made for their training weights for the next week. Always place your power/explosive exercises first or very early in your workouts. *The CNS fatigues faster than the musculature and remember technique is essential. Keep your rep schemes at 6 or under for greatest effectiveness. 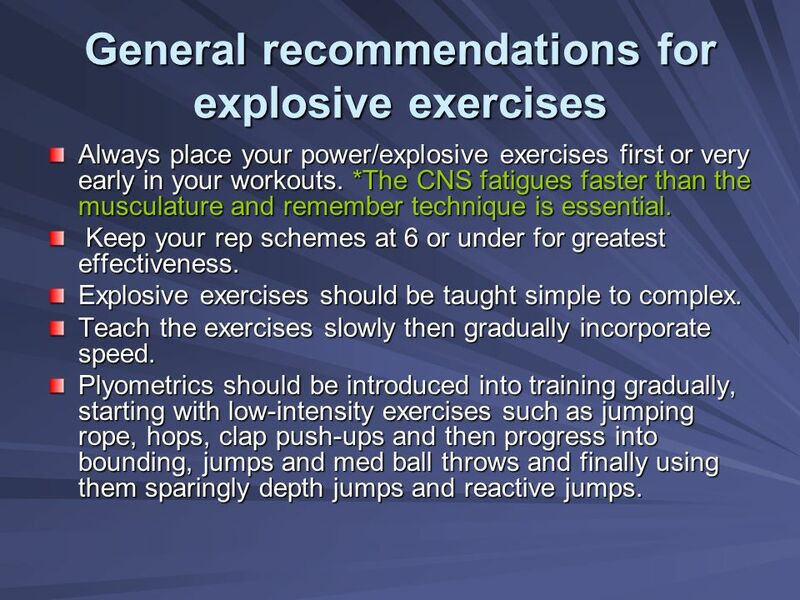 Explosive exercises should be taught simple to complex. Teach the exercises slowly then gradually incorporate speed. Plyometrics should be introduced into training gradually, starting with low-intensity exercises such as jumping rope, hops, clap push-ups and then progress into bounding, jumps and med ball throws and finally using them sparingly depth jumps and reactive jumps. 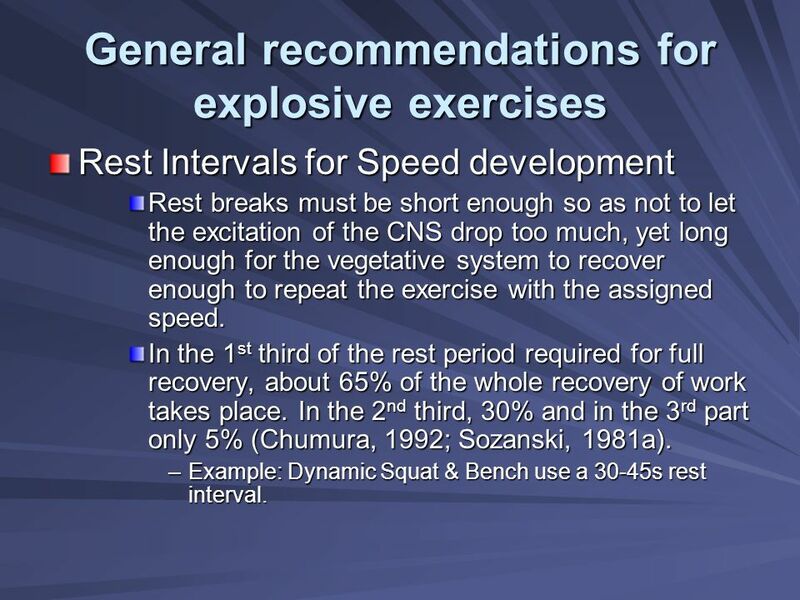 Rest Intervals for Speed development Rest breaks must be short enough so as not to let the excitation of the CNS drop too much, yet long enough for the vegetative system to recover enough to repeat the exercise with the assigned speed. In the 1st third of the rest period required for full recovery, about 65% of the whole recovery of work takes place. In the 2nd third, 30% and in the 3rd part only 5% (Chumura, 1992; Sozanski, 1981a). 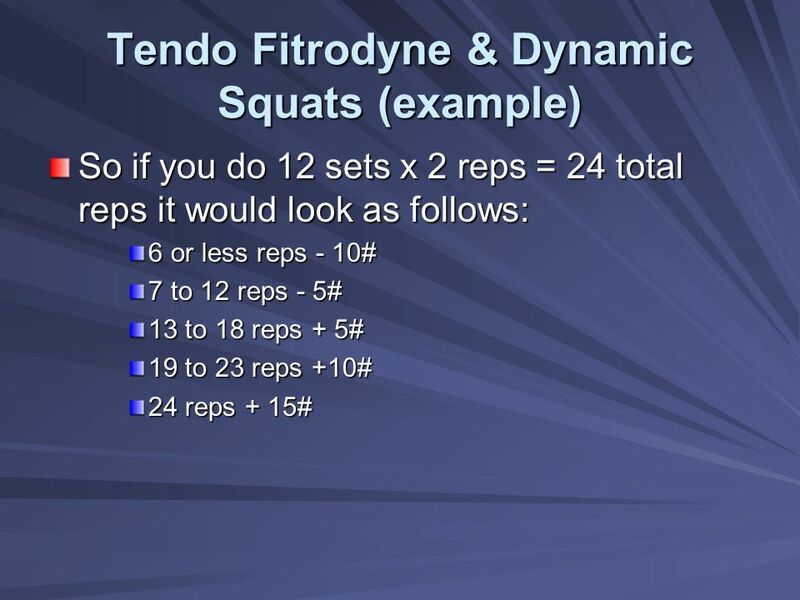 Example: Dynamic Squat & Bench use a 30-45s rest interval. 28 WARNING Beware of so-called speed and quickness experts. They tend to rely solely upon agility ladders, cones and mini hurdles. These drills are great for picking up your legs but remember that true speed and agility stem from the hip not the feet! If you as a coach focus your training program around the hip and then radiate out from there in importance you will have success. 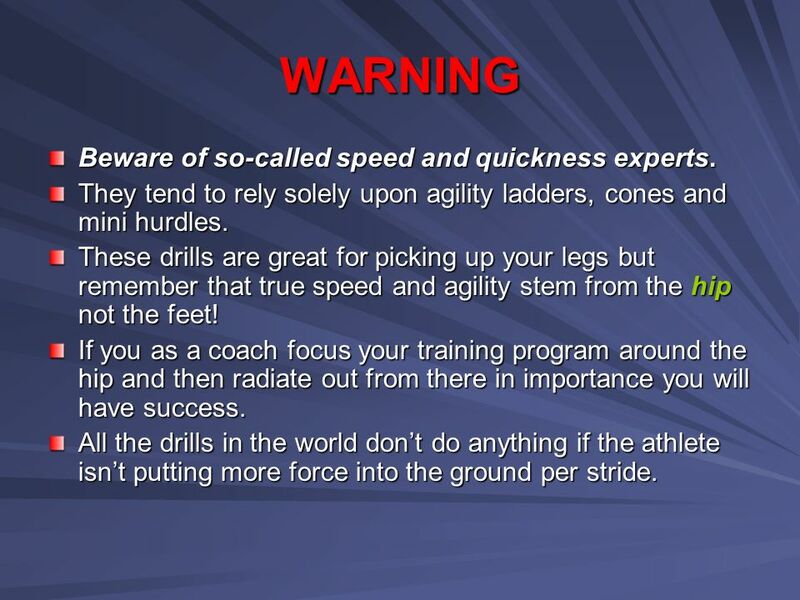 All the drills in the world don’t do anything if the athlete isn’t putting more force into the ground per stride. 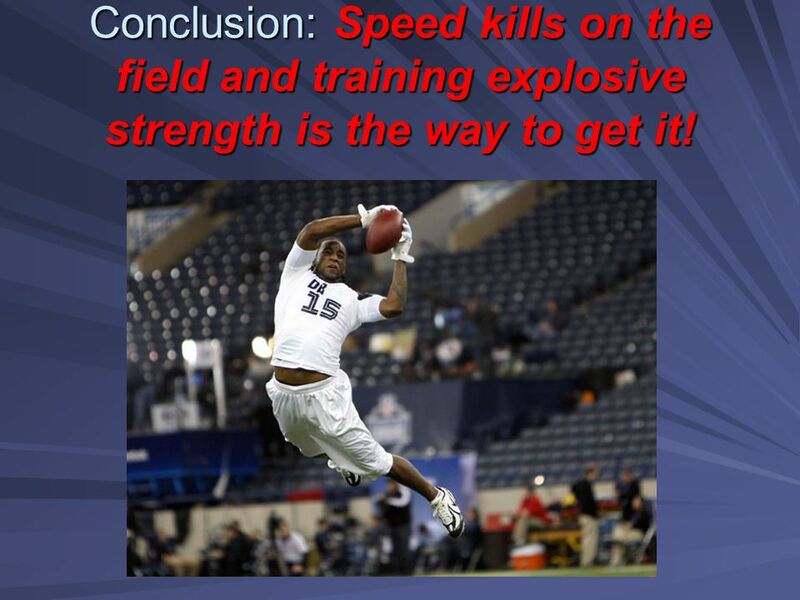 29 Conclusion: Speed kills on the field and training explosive strength is the way to get it! 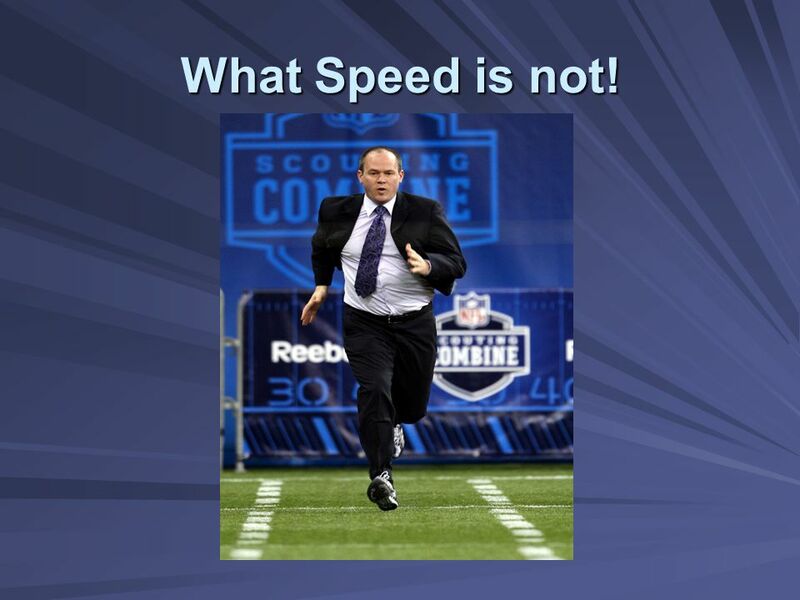 Download ppt "Speed in the weight room = Speed on the field." What Is Training? Makes the body more efficient Makes the body more efficient Makes the body better able to perform certain tasks Makes the body better. Keys to getting FASTER To improve one’s speed an athlete must obtain proper technique and form, while balancing workouts with proper rest. Warm-up Frontside. Resistance training By: Matt Fleekop. This refers to the type of training we participate in. The programme below was carried out during week 6 of a 6 week programme. The previous weeks were run; wk 1 = 70% final volume, wk 2&3 80%, wk 4&5 90%. 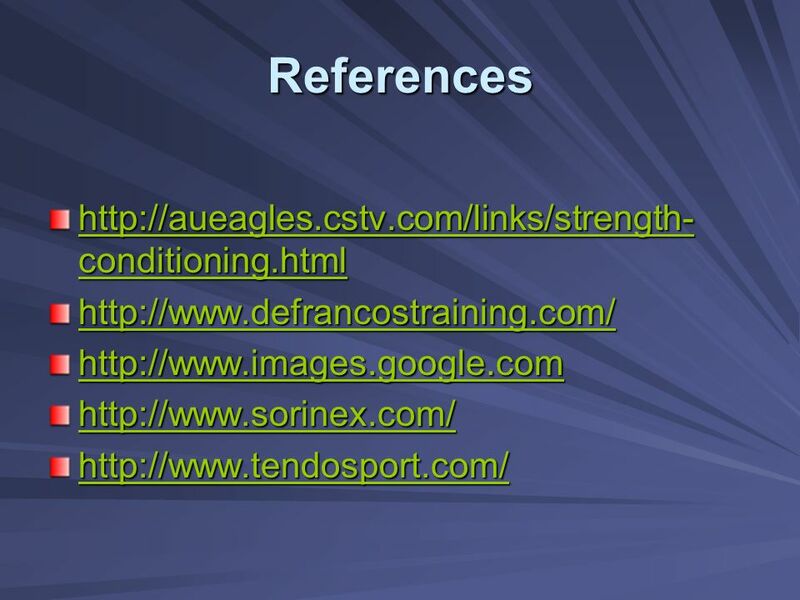 + Creating a Year-Round Training Program For athletes and trainers that work with athletes By Corey Schaffer. Speed Development Steve Blocker. Introduction Why Important? What is speed? Limiting Factors How to improve –Technique –Training methods –Periodization. PLYOMETRICS. Definition A quick, powerful movement involving pre-stretching the muscle and activating the stretch-shortening cycle to produce a subsequently.  General Strength  Medicine Ball  Olympic Lifts  Static Lifts  Ballistic Lifts  Bodybuilding Lifts. Chapter 6 Improving Muscular Strength and Endurance HPD 9. 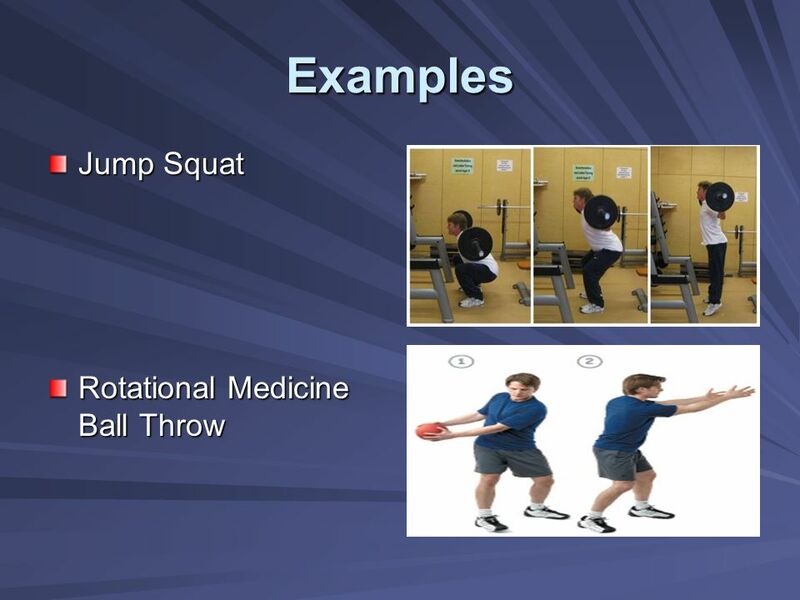 Lower Body Plyometric Exercises (Low Intensity) Squat Jumps 1. Stand with feet shoulder-width apart, trunk flexed forward slightly with back straight in. METHODS OF TRAINING This refers to the type of training we participate in.